I have made these for several art show openings and they have become a staple. They are always enormously popular, along with Turkish meatballs, crab and pork balls, and, of course, baked ricotta cake. (All, you will notice, can be made well in advance.) I feel that the zucchini fritters do need the aoili, though. Coarsely grate the zucchinis, then squeeze out as much liquid as possible. Place in a bowl and add the onion, haloumi cheese, flour, lemon zest, eggs and dill. Season with salt and freshly ground black pepper and stir to combine. 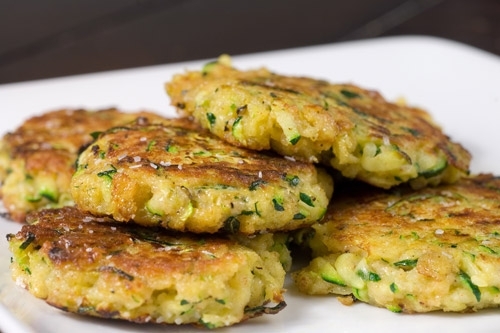 Shape the zucchini mixture into about 25 bite size patties. Refrigerate for about 30 minutes until firm. Heat the oil in a heavy-based frying pan over medium heat and fry, in batches, for 1 – 2 minutes each side until golden. Drain on a paper towel. Just before serving, place the fritters on a baking tray and warm in a pre-heated moderate oven. Serve with aioli to dip.